Folkus Gallery Band is a Christian Folk band which offers musical and worship services to churches in the Synod. 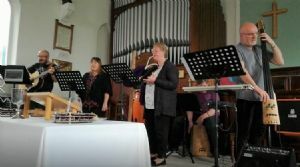 Using a wide range of music, combined with a creative approach to worship and reflecting on God's place in our lives, the band is a great opportunity for outreach. Revd Keith Hulse on 01925 269669 or 07884 954667.